Taste test: These chips really threw me for a loop, as they weren't at all what I expected they would be. I figured that, as with most other "kettle style" chips, they'd have some similarity to Cape Cod potato chips, with a strong crunch and curvy shape. They're actually not at all like that. They have a taste, consistency and texture that's almost entirely new to me. The chips I'd say they're most similar to (but far from an exact match) are some of the lard-based potato chips made in Pennsylvania. However, these aren't cooked with lard, but rather with partially hydrogenated soybean oil. You don't actually taste the lard in these, but the texture is similar. The crunch is much softer than Cape Cod chips, and the potato flavor is more subtle, somewhat oily tasting. They're kind of curvy, but not as curvy as Cape Cod chips or their imitators. Not a bad chip, but they're not fooling when they say "Our Original Recipe!" Smell test: Smells quite a bit different than other kettle-cooked chips we've had. Good, though. From the package: “Our Original Recipe!” ... “The Blind Date: Once in every person's life comes a horrific journey, a rite of passage, a high stakes game of roulette requiring many rolls of the dice to hit pay dirt. In many cases, it's just dirt. It's that modern ritual known as — the Blind Date. I vowed never again to utter those words, 'How will I recognize you?' after my last date cooked up canned spaghetti and a TV marathon of professional wrestling. But when my friend declared (for the 6th time) she'd found my perfect match, I sighed and mentally donned my dating fatigues. First, mark the battle sight. My current fix-up, Steve, suggested lunch. Brilliant — ripe with Plan B strategic maneuver-out possibilities — a meeting, a sick aunt to visit, or training for that marathon. Then, the call to arms: 'How will I recognize you?' This is a crucial question, to which the date will almost always spout the name of some movie start to whom they beat a striking resemblance. 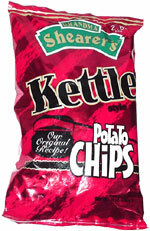 But Steve said 'I'll be the one with the Grandma Shearer's Kettle Style Potato Chips in the bright red bag. I eat them everyday for lunch. They're so light and crunchy, it's a little surprise for your mouth.' I'd never heard of Grandma Shearer's, but Steve got points for originality.